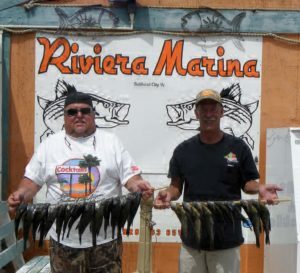 Lake Mohave is not producing much in the way of our stripped bass. There is some largemouth and smallmouth bass action. The coves around the dam and near the power lines are producing some largemouth bass while the shelves are having some smallies going after mostly plastics the dark hula tails and the pumpkin color are working well. The panfish bite is doing well but not of much size. However going down river below the Davis Dam along the Colorado river near and below the gorge you will find some great panfish activity. Pan fish, or also called bluegill, redear and sunfish in our neck of the woods, so to say. Our anglers Joel Pyne (black shirt) and Steve Jansen are showing about 25 they landed from their boat. These fish are best found in the plant life areas along the shorelines. A little closer to home and back up river along the casino row you can find some striper action. 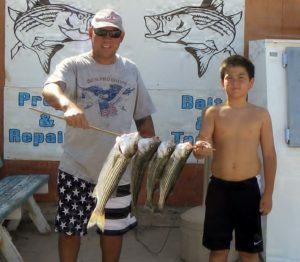 Ernie and son Kayden Calma were able to bring in these stripers, with the larger one at 2.84 pounds and 201/2 inches and one of the other larger ones at 1.90 pounds and 17 and 1/4 inches. This father and son team were using lures. They were having best luck with Savage Gear hard baits in a white swim pattern. 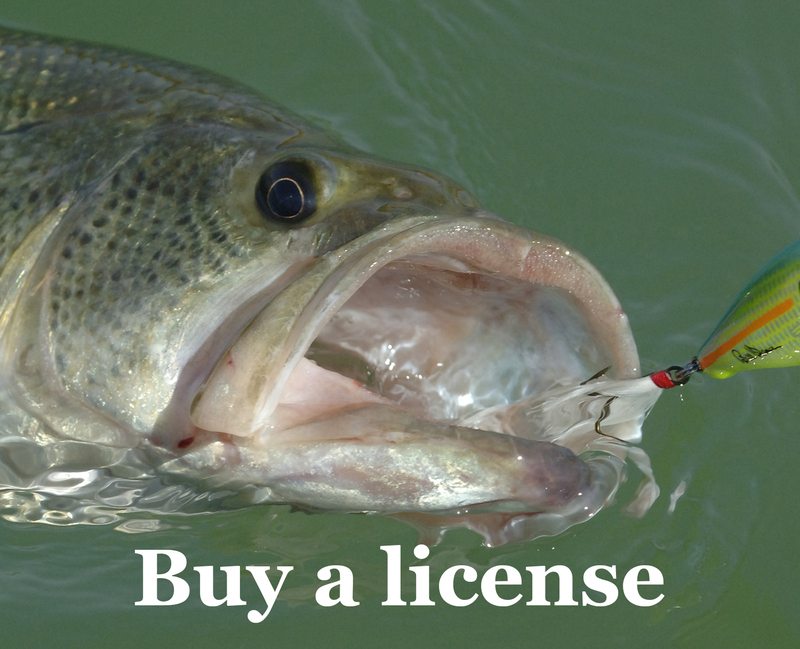 I have been hearing that the striper bite is doing well just below community park and above the big bend area. Rotary Park is a go to spot for you trout anglers. We are getting more rainbow trout here the first part of October. With that being said we hope to see you soon and remember the limit of trout is 5 below the Davis Dam. These trout are being brought to us from the Willow Beach National Fish Hatchery; this is a federal hatchery and they are up and running and it looks like its going to be a great trout season. Thanks for your support and ice that catch down to bring in and share.